Our YP Chalet room was comfortably air-conditioned and also had an attached bathroom, albeit with cold-water shower only. Our group consists of a bunch of scuba-diving buddies that visit Tioman pretty regularly, because, apart from the stunning beaches and laid-back ambience, the island also offers quite a few better-than-average scuba-dive spots. This was our first time staying in YP Chalet, but, in hindsight, I highly doubt that it will be our last time. We found that YP Chalet pretty much answer every need of a traveling scuba-diving troupe like us. YP Chalet is a budget-category accommodation located in the village of ABC. By the way, note that this village is actually called Ayer Batang (or Air Batang). The moniker ABC is a local invention, making it easier to remember for tourists. The "C", incidentally, stands for "Chalet". Anyway, YP Chalet's location is great, because there are plenty of scuba-dive companies located in ABC, as well in adjacent villages Tekek and Salang. 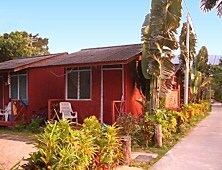 This makes YP Chalet very popular amongst the scuba-diving community, as well as those keen to take a PADI or NAUI dive course. YP Chalet is quite easy to find; all you need to do is head south as you come off the ferry jetty. After about 5 minutes, you'll come across a dozen or so tin-roofed chalets that each have a little patio in front. In fact, when you see something that looks like a tiny standalone little settlement, then you've found YP Chalet. Our room was air-con, but I was told that some of the other YP Chalet rooms are the even more basic type and only have a fan to keep things cool. We find this works well enough during the day, but at night the high humidity prevents us from sleeping soundly. This is where the air-con comes in. And certainly, if you're the beach-bum or water sports type, you'll be very grateful for having an aircon unit to keep you comfortable. Our chalet had an attached bathroom, although the shower was without a boiler or other kind of hot-water generator. But again, we're pretty hardy when it comes to cold water, given our long scuba-diving history. Besides, the shower water wasn't all that cold to begin with. Very doable, no worries. If you're a scuba-diver or back-packer looking for a bare-bones guesthouse in Tioman that has all the necessary basics, including a friendly room rate, then look no further than YP Chalet. As I said earlier, we'll definitely be back. Tip: YP Chalet has just a few rooms, so you'll need to reserve yours in advance, especially since, apart from being the go-to Tioman hostel for scuba-divers, YP Chalet also has a very sizable following amongst budget travelers and back-packers in Malaysia and Singapore. By the way, if you can't find YP Chalet on Agoda, call them direct on 013 9495725 . I found that it helps if you speak and understand a bit of Malay. Oh, YP Chalet has free wi-fi. The speed isn't broadband, so don't get your hopes up too high, but it's good enough for a spot of email or Facebook.